These 100% natural aromatherapy and herbal heat products are hand-crafted to provide you with comfort and quality. This ultra soft pack provides soothing relief to larger areas--just right for comforting menstrual cramping, back pain and strain. Fluted channels keep the herb mixture evenly distributed for maximum benefit. Use for hot or cold therapy. The combination of 12 aromatic herbs provides stimulating healing qualities. Size: 16"x24". 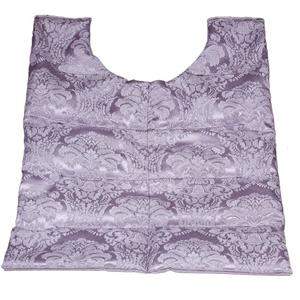 Choose from three fabric options: Plum Velvet, Lavender Brocade or Chocolate Velvet.